Sometimes, a work of art just leaves you speechless, in awe. Mary Pratt's paintings do that to me. I've been trying to write a description of why this is a favourite stamp, but am almost at a loss for words. I would obviously make a dreadful art critic. This was part of the Art Canada series and issued in 2007. A couple of years ago there was an exhibition of her art at the McMichael Gallery and I went back several times just to gaze at her paintings of domestic scenes and especially food, and wonder at the luminous light and feel as if I could reach out and touch the actual jars and smell the jelly inside. 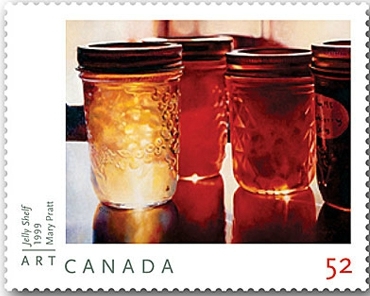 To achieve the effect of her photorealism pieces, such as "Jelly Shelf" shown in this Canada Post stamp issue, Pratt carefully eliminates any traces of brushstrokes through a painstaking process that involves using small sable brushes and painting cross-hatched strokes with a mix of turpentine and Liquin. Like other New Realist artists, she often works from slides. Her subject matter, however, remains uniquely hers and is heavily focused on things found in the kitchen of her home in St. John's, Newfoundland and Labrador. When asked by Canada Post whether she thought that she'd transformed the images of the domestic sphere into the subjects of serious art, Pratt replied: "They are serious art, the things women handle every day-the fruit, the jars, the jelly. [...] My role seems to have been to make people see things that are around them all the time that they never noticed before... to help them find the beauty of the simple things. I think that, in the past, people have not given enough weight to the images that women see. We have to eat. Food is important." Beautiful stamp, before reading the fascinating story behind it I thought it was a photograph. I like the effect of luminousity, there could almost be a firefly living in the jar. Interesting to learn about her technique. So real, it's hard to believe this is a painting, A prize for any gallery. Also I thought it a photo before reading your text. And thank you for all other great blog posts in 2016. Happy new year! It is the 'normalness' of a woman's routine around the home which suggest that is why there is so little documentation of their daily lives. Why would anyone want to read about something that presumably was done by every other woman alive?! It's hard to believe that's a painting and not a photo. That is a painting?!?!?! Wow, that is something else. I will definitely be looking up more of her work.